One of the areas of community concern about the development of a gas industry in the Territory, and the use of hydraulic fracturing, is the risk of damage to our natural environment. Much of this concern is focused on water; competition between the gas industry and other water users, the potential for impacts on groundwater and aquatic ecosystems from water extraction, and risk of contamination of surface or groundwater and associated rivers and wetlands. The government is implementing all the recommendations of the Inquiry, many of which will safeguard water and other environmental values through strengthening regulation and ensuring accountable industry practice. More specifically, the government will ensure gas activities are subject to the provisions of the Water Act, and water extraction will be licensed. Practices that pose an unacceptable risk to water resources, such as the use of surface water or reinjecting waste into aquifers, will be prohibited. Water allocation planning will identify the estimated sustainable yield of groundwater resources in regions subject to gas development, and ensure appropriate allocation of water to all users, including the environment and cultural uses. Climate change is a global issue and the Chief Minister has written to the Prime Minister to commence discussions on offsetting greenhouse gas emissions. The Northern Territory climate change and environmental offsets policies are under development and will be progressed in parallel with the delivery of this implementation plan. Managing our valuable water and other environmental assets in regions that may be developed for gas requires a detailed knowledge of the ecology and biodiversity of surface and groundwater ecosystems, and a sound understanding of aquifers and surface water systems. The Inquiry recognised that this detailed knowledge is lacking in many parts of the Territory. To address this, the government will work with independent experts, research agencies such as CSIRO, and industry to undertake a comprehensive Strategic Regional Environmental and Baseline Assessment (SREBA) in prospective onshore gas basins before granting any production approvals. A SREBA will provide baseline data to properly assess all the biophysical risks, allow planning to minimise the potential for cumulative impacts and provide a baseline for monitoring to ensure satisfactory environmental outcomes. It is anticipated that each SREBA will take at least three years to complete, and be largely funded by industry. Planning has already commenced for a SREBA in the Beetaloo Sub-basin, where the first gas developments are expected to occur. 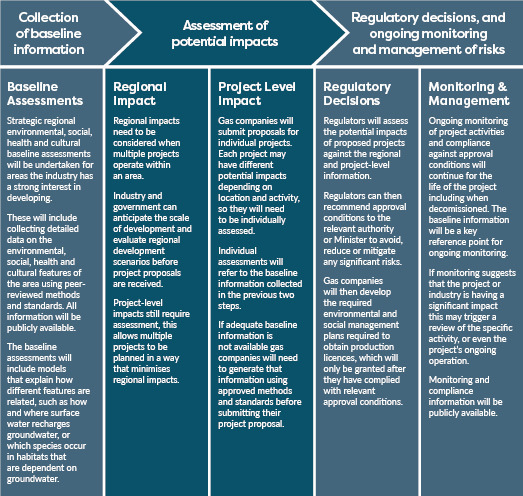 In this region, the Australian Government Geological and Bioregional Assessment Program will also provide independent scientific advice on potential environmental impacts of gas extraction, along with appropriate mitigation and management approaches. In line with the government’s approach to managing all aspects of the developing gas industry, transparency will be an important aspect of each SREBA, and the results of all studies and the underlying environmental baseline data will be readily available to the public. The Northern Territory Government will require that baseline weed assessment is undertaken in all areas subject to exploration for gas, before exploration takes place. This will be funded by industry, and carried out to standards established through guidelines prepared by the NT Government. Approval for exploration or production activity will include a requirement for ongoing weed monitoring and management to prevent new incursions or spread of weeds. The government will require regional baseline monitoring of methane concentrations for at least six months before granting any further exploration approvals. A longer-term regional methane baseline will be collected during a SREBA, before the grant of any production approvals. Methane monitoring will be funded by industry and undertaken in accordance with guidelines developed by external experts, commissioned by the NT Government. The government will commission a Strategic Regional Environment and Baseline Assessment (SREBA) for all regions where gas development will occur, starting immediately in the Beetaloo Sub-basin. A SREBA will be completed prior to any production approvals for gas developments in that region. The government will also work with CSIRO and the Australian Department of Environment and Energy to maximise the alignment between the SREBA and the Geological Bioregional Assessment undertaken by those agencies. A SREBA will include identifying, mapping and characterising groundwater‑dependent ecosystems. A SREBA will also identify and map the distribution of threatened species and their habitats. This information will be considered in the environmental assessment of onshore gas projects, to minimise the impacts of habitat loss. The government will ensure ongoing monitoring of any important populations of threatened species within onshore gas project areas. As part of a SREBA, the government and external experts will undertake modelling of the regional groundwater systems in the Beetaloo Sub-basin, to assess the risk of impact of extraction‑related activities on groundwater quality and quantity. The government will develop a repository for all data informing a SREBA, and make all results from a SREBA readily available to the public. The Northern Territory Government will amend the Water Act to cover mining and petroleum activities, which will ensure that water extraction for onshore gas activities will require a licence under the Water Act. This will include consequential amendments to mining and petroleum legislation. The government is considering the most effective regulatory mechanism to prohibit the use of surface water resources for any onshore gas activity, which will be implemented prior to any further exploration approvals for unconventional gas. The government will also implement measures to prohibit the reinjection of wastewater into aquifers. Regulatory amendments will be developed to protect existing water use by ensuring that the extraction of water for hydraulic fracturing does not occur within at least 1 km of existing or proposed groundwater bores for domestic or stock use without the landowner’s consent. Gas companies will be required to develop and implement monitoring programs to ensure the quality and quantity of groundwater is not adversely affected by gas operations. The government will develop options for a water pricing model that will be subject to community consultation. The government will ask the Australian Government to consider the merits of amending the Commonwealth Environment Protection and Biodiversity Conservation Act so that the use of water in Northern Territory onshore gas triggers assessment under the Act. The government has commenced scoping for a regional water assessment of the Beetaloo Sub-basin, including the Roper River region, as part of a SREBA. This will be completed before any production approvals are granted. The government will undertake similar water assessments of other prospective areas of gas activities as they are identified for potential development. The government will declare or extend water control districts over areas where there is potential gas activity, starting with the Beetaloo Sub-basin. Water allocation planning in these areas will identify the estimated sustainable yield of water resources, allocate water to uses and establish rules to guide water trading and water licensing decisions. This process considers the impact of water extraction on all uses, including groundwater-dependent ecosystems, cultural values and the environment. Water advisory committees with key stakeholder representatives will be established to support the development of water allocation plans. Gas companies will need to ensure that their activities, including any new infrastructure such as roads or pipelines, do not adversely affect the flow and quality of surface waters or increase the risk of erosion. A baseline assessment of weeds will be required in any area subject to exploration for onshore gas. Gas companies will be required to have an approved weed management plan and fund a dedicated weeds officer for each gas field to ensure effective weed surveillance and management. The government will develop an environmental offsets policy, which the community will have the opportunity to comment on, by the end of 2018. A SREBA will include studies of poorly known ecosystems that may be particularly vulnerable to impacts from water extraction and hydraulic fracturing, such as subterranean aquatic ecosystems and stygofauna. The regional baseline data collected for a SREBA will be essential for rigorous assessment of the environmental risks associated with the approval of onshore gas projects, as well as strategic planning of the development of gas fields and associated infrastructure. The regional biodiversity assessment will inform the identification of areas of high conservation value, from which onshore gas will be excluded. Detailed mapping of the distribution of high-value or sensitive habitats will allow infrastructure to be planned to avoid these areas. A SREBA will be completed prior to any production approvals for gas developments in that region, and industry will bear much of the cost of undertaking a SREBA. Gas companies will be required to have fire management plans for exploration and production areas, with robust monitoring programs and management actions to maintain fire regimes within established long-term regional baselines. The government will develop guidelines and implement regulatory measures to ensure sensitive habitats are identified and protected, minimise the extent of clearing of native vegetation for infrastructure, and ensure effective rehabilitation and revegetation of sites and corridors over time. The government will also introduce regulatory measures to ensure that indirect negative impacts on environmental health from gas developments are minimised, particularly risks associated with the spread of weeds and changed fire regimes. Discussions have already commenced with the Australian Government around accommodating the Northern Territory onshore gas industry within Australia’s national climate policy framework, and our national emission reduction commitments.